Multiple sclerosis is defined as an autoimmune disease that affects the brain, optic nerve, and spinal cord (central nervous system). An autoimmune disease is a type of disease where the body's immune system mistakes a normal tissue or cell for a pathogen and attacks it. 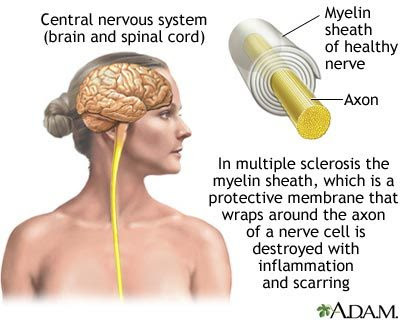 MS is caused when the protective covering surrounding nerve cells called myelin sheaths are damaged. When the myelin sheath is damaged, nerve signals travelling through the nerve cells slow down or just stop. The researchers found that the age-related impairment of the body's ability to replace protective myelin sheaths, which normally surround nerve fibers and allow them to send signals properly, may be reversible, offering new hope that therapeutic strategies aimed at restoring efficient regeneration can be effective in the central nervous system throughout life. Using a surgical technique, the researchers introduced an experimental demyelinating injury in the spinal cord of an old mouse, creating small areas of myelin loss, and then exposed those areas to cells found the blood of a young mouse. By doing so, they found that the influx of certain immune cells, called macrophages, from the young mouse helped resident stem cells restore effective remyelination in the old mouse's spinal cord. This "rejuvenating" effect of young immune cells was mediated in part by the greater efficiency of the young cells in clearing away myelin debris created by the demyelinating injury. Prior studies have shown that this debris impedes the regeneration of myelin. "Aging impairs regenerative potential in the central nervous system," says author Amy J. Wagers, PhD, an associate professor of stem cell and regenerative biology at Harvard University and Joslin, who co-led the study with Professor Robin Franklin, director of the MS Society's Cambridge Centre for Myelin Repair at the University of Cambridge. "This impairment can be reversed, however, suggesting that the eventual development of cell-based or drug-based interventions that mimic the rejuvenation signals found in our study could be used therapeutically." This could be particularly useful, she adds, in treating MS, which typically spans many decades of life, and thus is likely to be influenced by age-dependent reductions in the ability of myelin to regenerate. 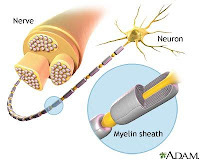 In MS, the body's own immune system attacks the myelin sheath and prevents nerve fibers in the brain from sending signals properly, which can cause mild symptoms such as limb numbness or more serious ones like losing the ability to walk or speak. As people with MS age, remyelination decreases significantly, eventually causing permanent loss of nerve fibers. "For MS sufferers," says Franklin, "this means that, in theory, regenerative therapies will work throughout the duration of the disease. Specifically, it means that remyelination therapies do not need to be based on stem cell transplantation since the stem cells already present in the brain and spinal cord can be made to regenerate myelin, regardless of a person's age."